Have you ever heard of the 4% rule? That’s the traditional percentage of your retirement savings you can spend each year and not run out of money because you were unfortunate enough to live too long. Given changes in investing strategies and market returns some people question the validity of that benchmark today, but nevertheless it’s in the ballpark. However, there are caveats. For example, if your investments take a nosedive in one year, taking the 4% may cause your plan to go off track. That means you may need to take less that year and to have other resources to make up the difference. 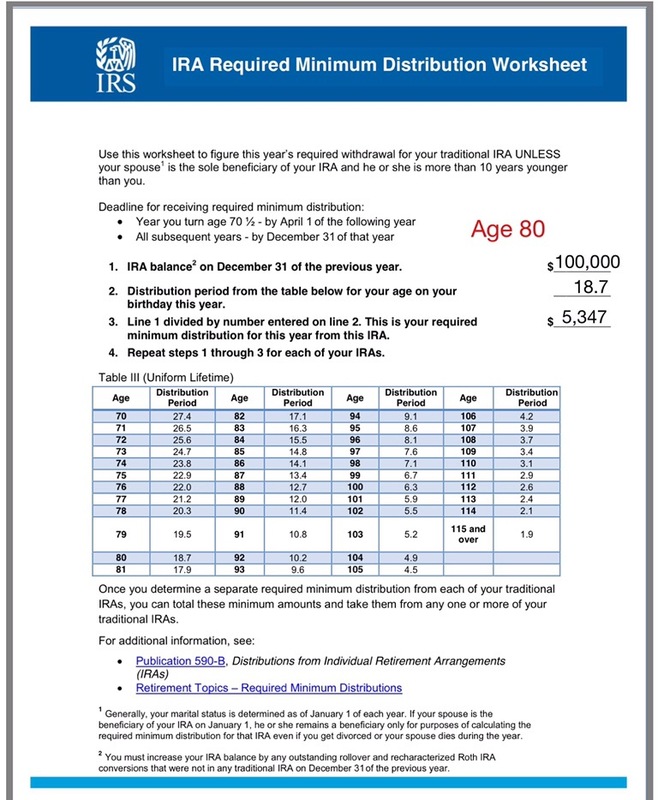 But back to the required amount you must take from your IRA, 401k plan or other qualified retirement plan once you reach age 70-1/2 which by the way, has a lot to do with the 4% rule. Simply put, as you age the IRS requires that each year you must take more than 4% from you retirement accounts. That means you need a plan. Will you just spend the excess thereby jeopardizing your long-term income or will you put any excess you must withdraw in an account for a rainy day (or down stock market)? And don’t forget all this money is taxable as ordinary income. So when planning on what you need to pay your bills in retirement, don’t just look at the amount you will withdraw, but the amount you get to keep after the Feds and perhaps your state get their share. Keep in mind too that a large RMD in a year could cause more of your Social Security to become taxable, raise your Medicare premium or even put you in a higher income tax bracket. Another point on required minimum distributions to be aware of for those coming up on their first RMD. 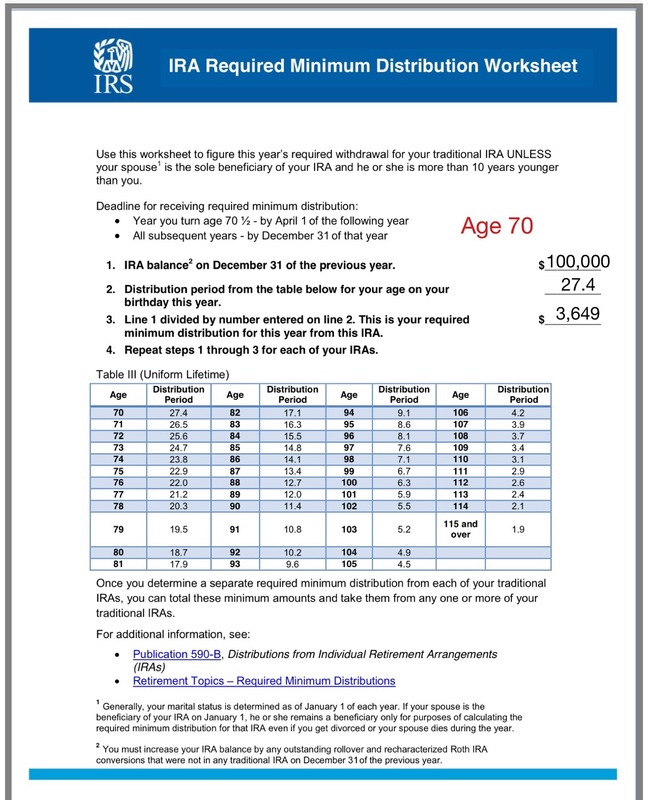 Your first distribution is not required until April of the year you turn 70 ½. After that, it is by December 31st each year. This may put you in the position of having to take two distributions in one calendar year and suffering any negative consequences that may arise from that. Good point and that could really jack up the Medicare premium, etc. You should probably consult your tax and legal advisors if you are coming up on RMD. The following should not be considered to be tax advice or legal advice. Assuming you have retired, the RMD for your 401(k) or other employer-sponsored retirement plan for your first payment is April 1st of the calendar year following the calendar year in which you reach age 70 1/2. See Internal Revenue Code Section 401(a)(9). So, for myself, for example, I reach age 70 1/2 on January 3, 2023, so, under the current rules, my first payout must occur on April 1, 2024, and the next payout on or before December 31, 2024. However, if you have not yet terminated employment at the time you reach age 70 1/2, RMD payments don’t start from the plan of your current employer until April 1st of the year following the year you terminate employment. So, if you are still working for an employer that sponsor’s a 401(k) plan, and you do not want to commence payments, you may want to examine your current employer’s 401(k) plan (or other, comparable employer-sponsored plan) to see if it accepts rollovers. If it does, you may want to rollover vested benefits from other employer-sponsored plans and any after-tax or taxable IRA monies if your goal is to allow those monies to continue to accumulate on a tax preferred basis. Because Roth IRA monies are not subject to RMD, another strategy would be to convert taxable monies in your employer-sponsored 401(k) plan as well as any after-tax IRA monies into Roth IRA assets. Generally speaking, distributions to the owner or beneficiary of a Roth 401(k) can be tax free once the owner meets certain age and participation requirements. Note, for comparison, however, that Roth 401(k) monies ARE subject to RMD – so, RMD applies to your employer-sponsored plan unless you are still working for that employer. So, if you have Roth 401(k) assets in your current or former employer’s 401(k) plan, and if you do not want to take them as part of a required distribution, you may want to consider rolling them over to a Roth IRA. (2) The tax penalties for failing to take RMD payments are significant – so, you should check with your 401(k) plan and IRA vendors on their processing. Again, be careful, and even tax experts will seek out advice of tax and legal counsel or accountants when fashioning compliance with RMD requirements. Good information. I figured that there was some kind of IRS table but it is one of those thing by using tax programs instead of reading paper instructions like the old days that you miss out on. Call me crazy but I think the IRS got it wrong. They should have you withdraw 1.9% at age 70 and 27.4% if you are over age 115. Chances are you are not going to live much longer than 115 and then your beneficiaries are likely get the money tax free. Or they should just let you keep it as a longevity bonus. You must have saved Medicare a ton of money to live that long. When you (beneficiary) take a distribution from an IRA, it’s taxable income. But because that person’s estate had to pay a federal estate tax, you get an income tax deduction for the estate taxes that were paid on the IRA. But if there was no estate tax, the distribution is taxed as ordinary income.